Living here in South Florida, I’m pretty spoiled when it comes to Jewish food. There are Bagel places and delis around every corner. If I feel like having a turkey and chopped liver sandwich with a black & white cookie for dessert, I hop on over to TooJay’s restaurant, which is 10 minutes down the street. When we move to North GA this summer, I’m sure it’s going to be a shock to be faced with the dearth of Jew-food when I’ve basically been surrounded by it for my entire life. I thought I’d make a list of the 10 best Jewish comfort food recipes that I’ve found online, so that I can refer back to them when I’m up in GA and dying for something delicious! 1. Cheese Blintzes – I love cheese blintzes because they are like eating both breakfast and dessert at the same time. Warm and delicious, with a sweet filling. 2. 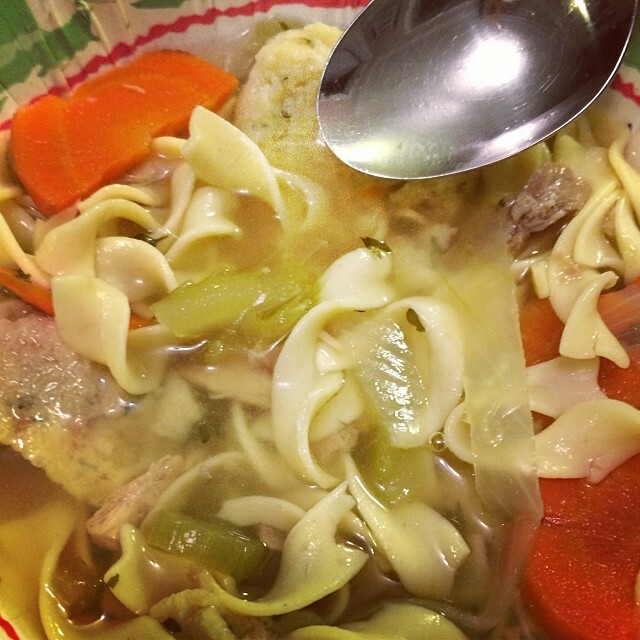 Chicken Noodle Soup with Matzoh Balls – This is exactly how I like my Jewish Penicillin! My favorite way to eat matzoh ball soup is with tender chicken and egg noodles. This looks delicious. 3. Potato Knish – I absolutely love knishes and have memories of eating them at the Festival Flea Market … um, and pretty much everywhere… when I was younger. Yum. 4. Egg Creams – Technically not a “food” but this yummy drink is a definite source of comfort. The article linked provides a bit of history of the Jewish origins of the New York Egg Cream along with the recipe at the bottom. I have wonderful memories of drinking this magical fizzy-chocolatey concoction with my grandpa as a child. He always made sure to give me plenty of chocolate… my favorite. 5. Kasha Varnishkes – This dish not only has a funny name, but also has a funny texture due to the buckwheat. The taste is slightly nutty, and it is oddly addictive. It’s one of my favorite traditional Jewish-holiday foods. 6. Latkes – While they’re best-known for being enjoyed during the holiday of Hanukkah, they can be eaten year round as a side to any meal. Most people serve them with sour cream and applesauce, but the recipe I linked up uses pumpkin preserves, which (if you know me and my pumpkin obsession) sounds amazing! Most people also grate the potatoes & dice the onions by hand, but this recipe uses the food processor, which is also great for people like me, who like to cook but hate to prep. I love my latkes hot and crispy! 7. 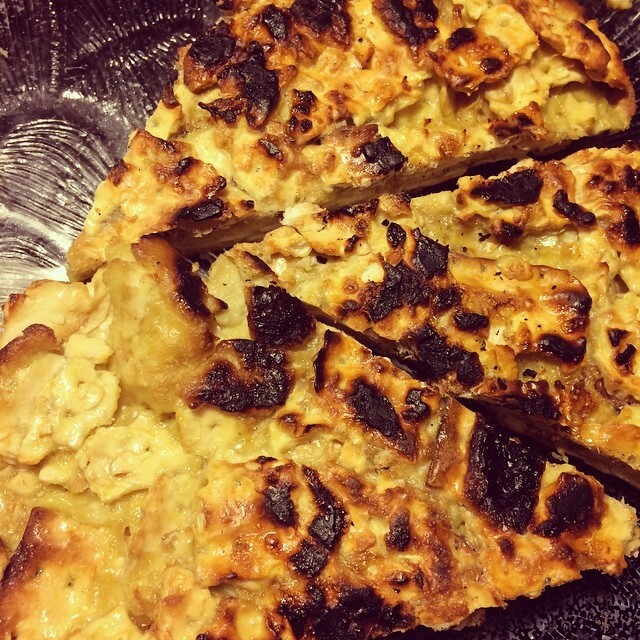 Matzoh Brei – All Jewish people will know that matzoh brei is one of those dishes that can be made literally a thousand different ways. Salt, sugar, cinnamon, flat like a pizza or scrambled up. With syrup or without. You can really tailor this dish to your own unique preferences. The recipe I linked is the closest in “style” to how I make matzoh brei (flat, cut like a pizza), except I only include a bit of vanilla extract, eggs, milk, and matzoh in my recipe (and nothing else), and I top it with kosher salt. I like mine very crispy. I do not like it scrambled up, like other recipes show. Matzoh Brei is perhaps my favorite Jewish comfort food that I crave all the time and love making. 8. Lox, Eggs, and Onions – This is a simple but delicious recipe that can be made for any meal of the day. The sweet onions and soft eggs provide a nice contrast with the salty taste of the lox. And you must use real lox, not smoked salmon! This recipe is one of my dad’s specialties. 9. Challah – Best. Bread. Ever. There is no contest. Challah bread, if you’ve never had it (shame on you) is a delicious, soft, sweet, braided egg bread. It makes fabulous bread for grilled cheese sandwiches and french toast, or you can just eat it on its own. My kids love it and so do I! 10. Hamantaschen – A delicious Purim treat, our Publix grocery often sells them year round to complement ALL Jewish holidays. I know that’s not going to be the case in Georgia! I love eating these triangle-shaped, flavorful cookies, and so do my kids.